The British Prime Minister, David Cameron, is in India to court the world’s biggest democracy for closer business and trade ties. In a progressive move that should see the strengthening of relations, the ultimate objective will see more job creation in the UK. The Prime Minister’s resolve is evident in what Downing Street can only describe as the biggest trade delegation from the UK in living memory where the prime minister is expected to announce that he would like to make the UK the “partner of choice” for India. A host of senior cabinet colleagues and business executives are accompanying David Cameron on his Indian visit hoping to get a slice of this rising economic superpower. Over the past decade India has taken a central position on the world stage and the British government recognises India as a vital economic and regional partner in the drive to boost investment and exports. 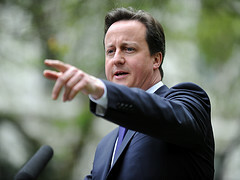 “I have come to your country in a spirit of humility” David Cameron wrote in a piece for The Hindu newspaper. The bottom line is that India is fast becoming a major trading target for government and businesses all over the world. Britain has always had a special relationship with it’s ‘old colony’ and the new British coalition government has woken to the fact that if India is not on the radars of British business they are likely to miss out on huge opportunities.